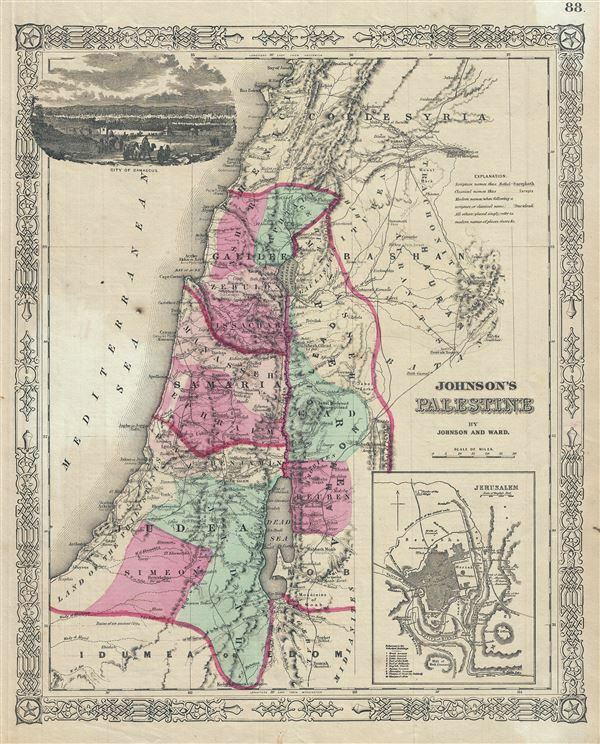 This is a beautiful example of Johnson and Ward's 1863 map of Palestine, Israel or the Holy Land. It details the region from Beirut south to Busaireh and Kadesh Barnea and extends eastward as far as Mount Alsadamus in modern day Syria. Offers both contemporary and ancient place names, often noting multiple names for the same political and geographical features. Also shows numerous roadways and caravan routes throughout the region. An inset in the lower left hand quadrant details Jerusalem with 10 important churches, biblical sites, and mosques noted. An engraved view of Damascus decorates the upper left quadrant. Various towns, cities, rivers and several other topographical features are noted with relief shown by hachure. This map features the fretwork style border common to Johnson's atlas work from 1863 to 1869. Published by Johnson and Ward as plate no. 88 in the scarce 1863 edition of Johnson's Family Atlas. Very good. Text on verso. Minor spotting.